context :: d-form + pd~convention04 + trans cultural mapping > reclaim the streams! d-form + pd~convention04 + trans cultural mapping > reclaim the streams! 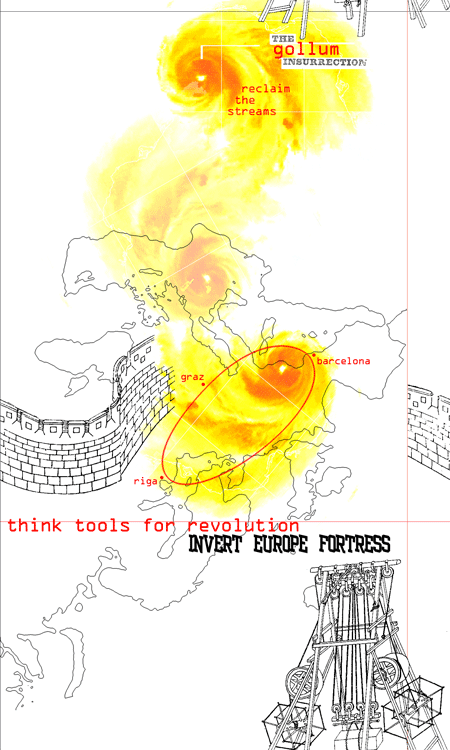 Think Tools for Revolution! At times the calendar is capricious & important events happen at the same time and in different places. Sometimes one has the intuition that there will be a before and an after to this chain of hidden coincidences. This article explains and calls for the spontaneous fusion, vital & necessary , of these three events in Fortress Europe, in this autumn without leaves. This non-coincidence will be from the 1st to the 3rd of october. In Riga, Art+Communication: Trans Cultural Mapping, will exhibit the conclusions of the recent workshops from locative.net. The culmination of months of study under the umbrella of the european Trans Cultural Mapping program. A cocktail of Locative Media, Spectrum Ecology, Tactical Cartography and Endocolonisation. Art+Communicaction has the role of Thinktank in the triple event : where theory positions itself politically. At the same time in the pd~convention04 (Graz) it is the first time that the kernel of the most revolutionary program in the 'free' market have gathered together. Pureè Data is a project of one of the most trash communities of free programming in history, a ballbreaking which will be retransmitted from Graz. A group of artist programmers will show what they have done in their caus - mainly, universities & hacklabs - these last few years. They are a trash community that play a sort of chinese go that propose the tools for the new strategy of netmedia. "A celebration of our alternative culture" claims D-Form (Barcelona). D-Form is a sort of Akira that grows & grows. Its much more than a party and less than a revolution, but it is the beginning of a strategy of global resistence against an already failing Capital. They say that people are coming from all over Europe and beyond, the call of the Revolution has arrived ! The video and audio streams from the Think Repository of Riga, the Tool Kit of Graz & the Permanent Revolution of Barcelona are transmitted via gollum.artefacte.org, a tool for the new era. We live in a society bombarded with information from a corporate media that seeks to shape our lives into consuming, working and self obsession. The value of community has been reduced to that of the services provided by local government. The streets reduced to pathways for oil driven vehicles and consumerism. The vast majority of the community of Europe has been conquered and disempowered by an authoritarian structure dictated to by global elites. These global elites have control over our energy requirements, our natural resources, our food, our water, our air, our health. This absolute power means they are free to destroy and exploit indigenous peoples, nature, global climate and wage wars against our will. So what use is information within this scale of global injustice? Because we are being fed mis-information our alternative culture has developed its own media. Information then becomes a real solution, but only if we know "how" to use it. For it is the deeds and not the words that have the power for change. The information that will be provided @ deform is information for action, seeking solutions on local and global levels. Practical skills as a practical means to rid our lives of the global elites and offer the wider community the sliver of a chance of re-evolution. The struggle remains to reclaim the future.